This page sets out the way in which your Church uses its resources, and the ways in which you can contribute to them. St Peter and St Mary’s costs roughly £300 a day to run, £2,100 a week. Our electoral roll for 2018 had 201 people on it, 56 of whom live outside our parish. We have run at a loss for several years, the spending gap being met by taking from reserves which were boosted by a legacy of over £50,000 in 2014. This is a great way to help. By using a Gift Aid envelope (if you pay tax) it increases the value by 25%. Weekly envelopes are a way of regularly giving. You are supplied with a set of numbered and dated envelopes, one for each Sunday of the year. The number enables Gift Aid to be claimed. Alternatively, you can set up a standing order. We can help you set this up and it only needs doing once. You can review it and change the amount at any time, and again you can specify that the donation if Gift Aided. This is a relatively new way of Giving. 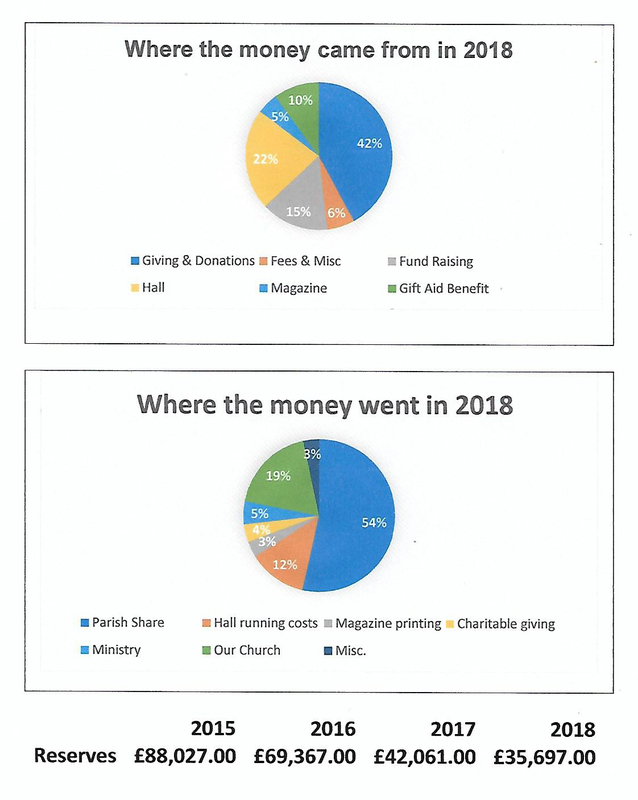 The Parish Giving organisation, which does not charge for its services, collects a standard amount monthly via Direct Debit, and claims any Gift Aid for the Church. You can review the amount at any time, or request that it be increased annually by the rate of inflation. Why not remember your Church in your Will? A Guidance leaflet on this is available at the back of the Church. People sometimes make a one-off donation: in memory of a loved one or to mark a wedding, baptism or renewal of vows. Again Gift Aid enhances its value.